I know I haven't talked skin care in a skinny minute, but this deal is just too good to pass up. 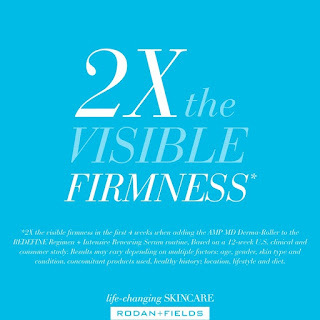 I love all the products I've tried with Rodan and Fields. And I have tried ALL of the regimens and most of the enhancements (Last Boost it still my favorite, see Exhibit A). What I have grown to love, and I didn't think I would, is the AMP MD Roller. The idea of rolling my skin was not something I thought I would do. I used it sporadically and loved how my skim responded, but I wasn't using it daily or even every other day. So, one day, I decided it was time to give it a run on a regular schedule. 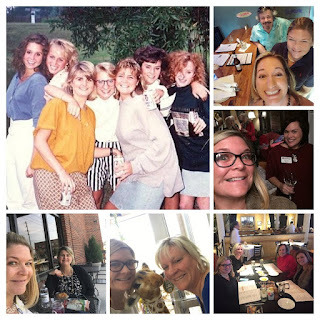 I had been using the Intensive Renewing Serum (ladies, if you are over 40, you need to be using a serum of some kind) and it was really giving me soft skin. As I started to up my use of the roller, though, I started to notice this dewy complexion. All of my skin care seemed to be amplified and one night last week, I found myself gawking at my skin in the mirror. I thought, damn, my skin looks good. I mean gggggoooooooddddddd! It's supple and plump, and smooth. So smooth, I find myself running my fingers across my face just to feel that softness. Okay, Okay, I know that sounds weird, but let me ask you....if your skin felt like velvet, wouldn't you touch it, too?? 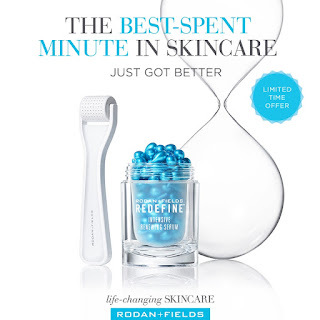 For the month of May, Rodan and Fields is offering an incredible discount on the Redefine AMP MD System. The AMP MD Roller and the Intensive Renewing Serum that is regularly $220 is now $176. You can sign up as a Preferred Customer for 10% more off (there is a one-time Preferred Customer charge of $19.95) or you can order as a retail customer. If you are interested in ordering as a Preferred Customer, contact me here. And I will walk you through it all and give you all the tips and tricks. Nervous about the roller? Using is it very easy and it will revitalize your skin! Follow this link for full instructions. Want to browse the site and check out the other products? Go HERE. Let me know if you have any questions. You can always shop as a retail customer, but let me warn you....once you've tried these products, you will be back for more. They work and they make your skin look amazing. I know the pic below is not consistent in place, but you can see the dark spot on my cheek from last summer. It is but a speck today thanks to the Reverse Regimen. My face is so much clearer.